During World War I, members of the Maxey family lived in the Sam Bell Maxey House and were active in support of the war effort on the home front. By the time the war started, Sam Bell Maxey Long was too old to join the military, so he, his wife Lala, and his cousin Sallie Lee Lightfoot, did what they could for the American troops through their involvement in the local Lamar County Red Cross chapter. According to an article found in The Paris News from November 4, 1945, the Lamar County Red Cross chapter was founded in 1917, soon after the U.S. declared war on Germany. To better serve the needs of the troops, the citizens of Paris felt there was a need for a full Red Cross organization in Lamar County, rather than just a few volunteers. In the same article, it mentions that both Sam Bell Maxey Long and Sallie Lee Lightfoot were elected officers at the first Lamar County Red Cross meeting. The Sam Bell Maxey House has many artifacts related to both World War I and to the Red Cross, from which staff and volunteers can learn more about what the family did during this time. We know from The Paris News that Sam Bell Maxey Long was the chairman of the Lamar County Chapter of the Red Cross, and that Sallie Lee was also elected as an officer, but what about Lala? That’s where the artifacts inside the house are useful. Based on the artifacts, we know that Lala was involved with the Red Cross during World War I and for at least a year after the end of the war. 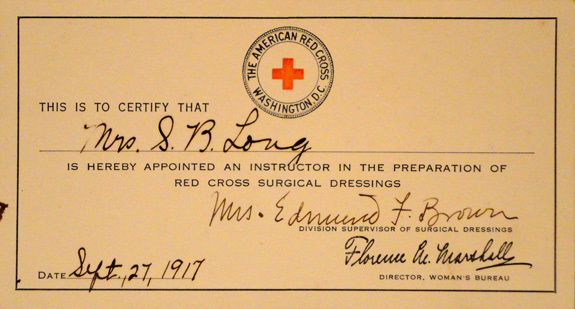 In 1917, Lala was appointed an instructor in the preparation of Red Cross surgical dressings. In 1918, she became an appointed member of Company D, Lamar Canteen Service. The Red Cross Canteen Service offered a hot meal to soldiers passing through the area. Besides meals, the canteens gave soldiers other goods, such as chocolate, cigarettes, fruit, ice cream, and newspapers. Some canteens had reading rooms and showers for the soldiers to use. As an officer for the local chapter, Sallie Lee was involved with the Chapter Committee on Nursing Activities. The chapters were involved with the training of nurses for the local community, rather than nurses that would be sent overseas. We can’t determine for sure what involvement Sallie Lee had with the training of the nurses, but she is listed as the Chairman of the Chapter Committee on Nursing Activities on a certificate presented to Lala during her participation with the Red Cross. Along with his work in the Red Cross, Sam was also a member of the Four-Minute Men, who were volunteers within the Committee on Public Information. There were 75,000 speakers across the U.S. who made more than 750,000 speeches about the state of the war at movie theaters, fairs, churches, and other public events. Each member wrote their own speech, but the Committee on Public Information sent them “bulletins” suggesting themes that their speeches should address, all of which involved the American war effort during World War I. The Four-Minute Men spoke about many topics relating to the home front and what the American people could do to contribute to the war effort, including speeches about Liberty Bonds and donating to the Red Cross. We’re very proud to know that even though Sam couldn’t fight in World War I, he and the rest of the family did what they could to help the soldiers and local organizations during the war. 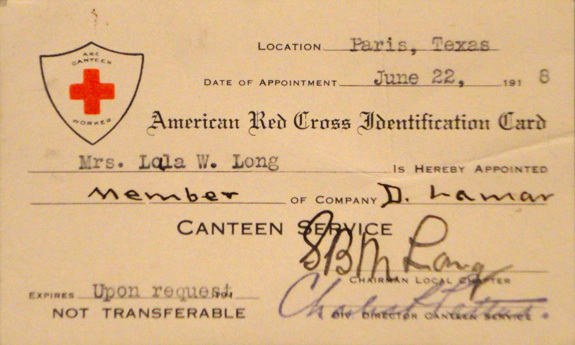 Lala’s Red Cross identification card from 1918; notice that Sam signed as chairman of the local chapter.